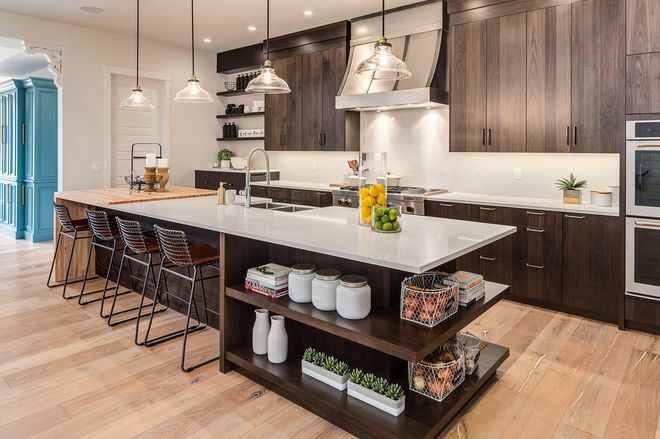 The backstory: Michael and Nicole Tew designed and built this home on an infill lot in Calgary as a show home for their company — he’s president, she’s vice president of marketing at Trickle Creek Designer Homes — that they planned to eventually sell. But a funny thing happened along the way: They realized that they’d created their own dream home. As builders, the couple would have felt a lot of pressure had they been designing for themselves. But while working on a show home, they felt the freedom to just have fun. They plan to move in this October. 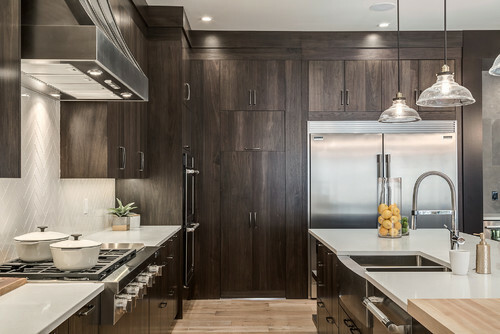 Cabinetry: For most of the kitchen, the couple chose slab cabinets made from walnut in a custom stain. They took the upper units all the way up to the 10-foot ceilings. They considered finishing the upper cabinets with glass-front doors but decided not to, as “it felt more country and less modern,” Nicole says. 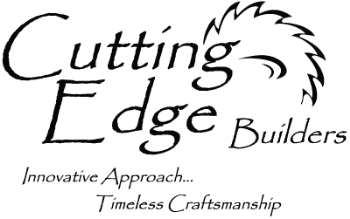 They wanted some cabinetry to have a built-in, furniture-style look. 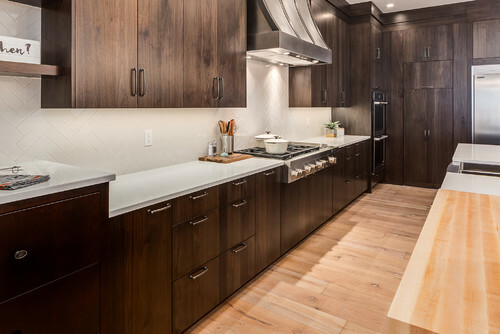 So they chose maple, stained darker than the walnut, for the cabinets under the open shelving on the left side of this photo, and for the wine storage unit (visible in the next two photos). The darker stain helps the maple stand out from the walnut. Here’s a closer look at how the maple, on the far left, contrasts with the walnut. Here’s the maple wine storage area, on the opposite side of the kitchen from the open shelving area. “We wanted to make sure those parts looked different and felt like furniture,” Nicole says of the maple pieces. The wall consists of concrete tiles, and this side of the room faces a wood fireplace that contains concrete as well as the same oak used on the island. “Our intention was to try to connect the spaces by using the same materials,” Nicole says. 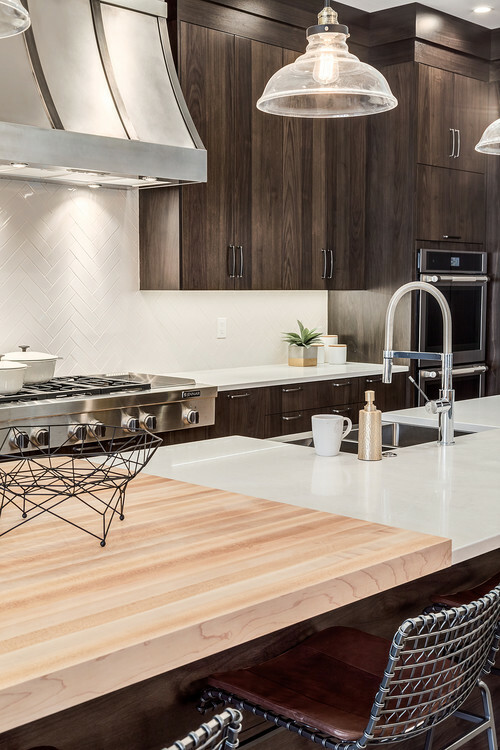 The island: The kitchen island combines white quartz with an oak butcher block waterfall counter that caps the end. 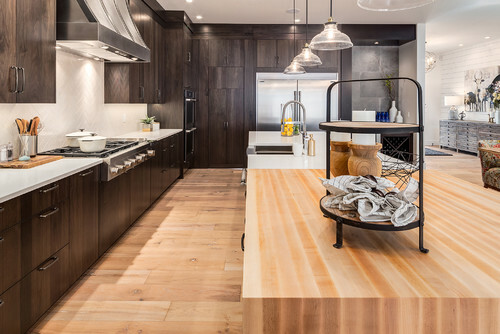 “We wanted something with a really natural feel,” Nicole says of the oak. 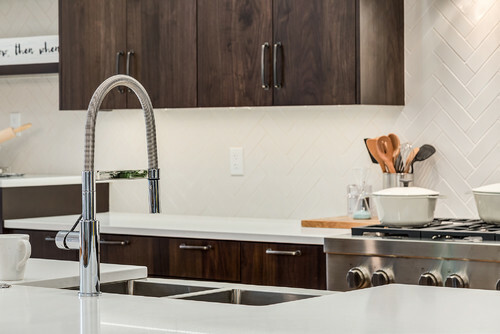 Faucet: The clean-lined faucet on the island sink helps give the kitchen its modern feel. 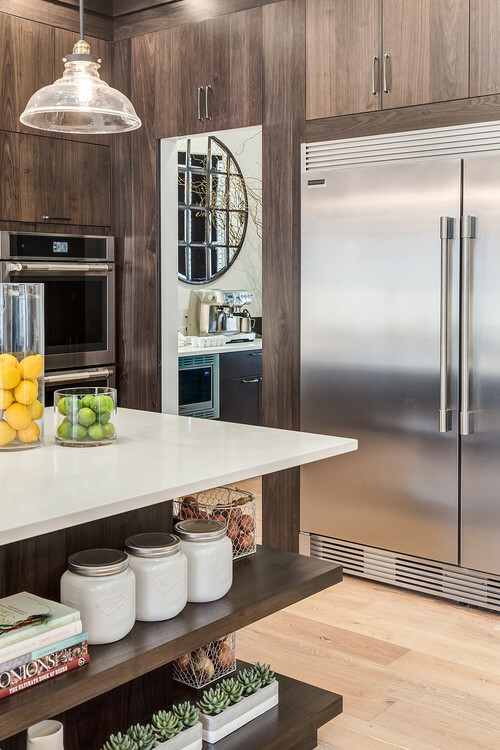 Countertop: The island quartz and perimeter countertop are the same material, a white Caesarstone. Range hood: The hood is a custom design the Tews came up with. They took a drawing to a local maker, who transformed the idea into reality. 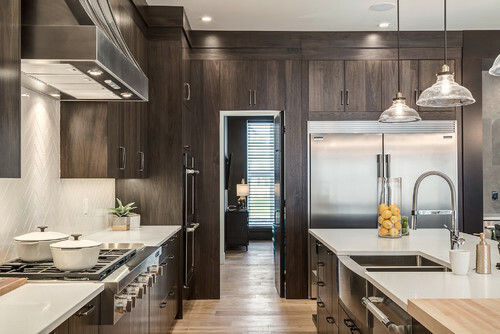 Pendants: The couple wanted the range hood to be a focal point of the kitchen. “So we needed to choose a pendant that was special, but not too special,” Nicole says. Glass with gold accents fit the bill, complementing the space without distracting from the hood design. 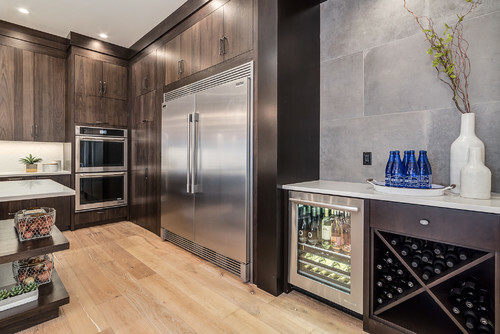 You can get a glimpse of the butler’s pantry in this photo, in the open door to the left of the refrigerator. It contains a countertop, microwave and cabinetry. Beyond it, the private office has two large lounge chairs and a TV — but no desk. 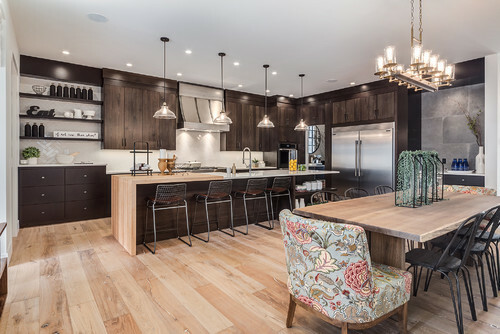 As the photo shows, the island features open shelving on this end, which is opposite the waterfall butcher block end.